Mr. Fox used to steal squabs. Now he writes a daily column for a local newspaper. He has a loving wife and a son who is.....different. But there is something missing from his life. After he buys a bigger house (a tree as opposed to a normal fox hole) Mr. Fox decides to pull one last job. That job? Robbing the 3 meanest farmers in the land; Boggis, Bunce and Bean. Wes Anderson is well known among the film nerd circles for his quirky, melancholy films that generally star the same people. Many people are saying that this is a departure for Mr. Anderson and I wholeheartedly disagree. This film is not only a typical Anderson film, but the one he has been working towards his whole career. Anderson has a flair for the picturesque and Mr. Fox gives him that opportunity around every corner. The thing with animation is that it can be as surreal as you want it to be and it's okay. Wes's unique vision and use of colors through his films are perfect for this medium. The backgrounds are generally static (save for one stunningly beautiful scene in front of a waterfall of sorts) with the characters moving in the shot. The film is stop-motion and took well over a year to complete. While the film is visually compelling the story drags at points. It's very well told and quite charming, but could use some trimming here and there. Though, I can't blame them. I'd want to show off all of the work I'd put into something this ambitious as well, but the cost was the pacing of the film. The story is a typical Anderson tale, a character is unhappy with their life and does something drastic to change it. This ends up hurting those they care deeply about and they realize the act was selfish. Supporting characters are insecure and become comfortable with who they are meant to be by the end of the film. But it's just so darn hypnotizing! The animation is spectacular and the dialog is snappy and sharp. George Clooney is in full Danny Ocean mode here, fast talking and smooth walking his way out of every situation. 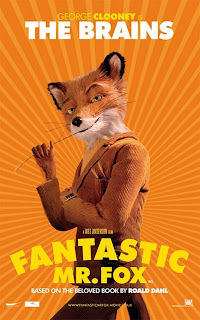 All in all, the Fantastic Mr. Fox is a wonderful animated tale about facing your fears, being yourself and seeking redemption. Wes Anderson skillfully directs this story with some incredible stop motion effects and portrait worthy backgrounds. Leave the kiddos at home though, they would be thoroughly bored. Expect a rant a little later about this.